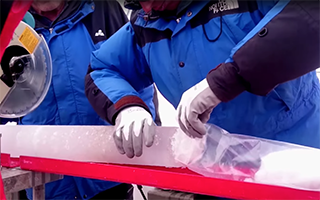 Researchers from The Ohio State University are studying the oldest ice core ever drilled outside of the North and South Poles, thanks to an international collaboration co-led by Lonnie Thompson, Distinguished University Professor in the School of Earth Sciences. The ice core — drilled from the Guliya Ice Cap in Tibet — may include ice that formed more than 600,000 years ago, making it one of the oldest ice samples ever recovered. The ancient ice contains valuable information about past climate conditions on Earth, which scientists can compare with modern climate models to make predictions about the future. What researchers have found so far “provides dramatic evidence of a recent and rapid temperature rise at some of the highest, coldest mountain peaks in the world,” according to a university news release. In fact, temperatures in this region are rising at nearly 1.5 times the rate of temperatures at sea level, according to the Intergovernmental Panel on Climate Change. “Generally, the higher the elevation, the greater the rate of warming,” Thompson said. Tibet also contains the world’s third-largest store of freshwater ice, and increased melting in the area, as well as in the Arctic and Antarctica, are greatly contributing to rising sea levels. Rapid glacial melting could eventually be catastrophic for the 1.5 billion people in Asia who depend on high-altitude glaciers for a fresh water supply during dry seasons and in times of drought. “You might think of glaciers as a savings account, in which snow (water) is deposited every year. Under today’s climate, more water is being withdrawn than is being deposited, and the account is dwindling,” said Thompson, adding that scientists also expect to see decreases in yearly precipitation. He and his research team hope that studying the ancient ice will uncover parallels that exist between ice loss in tropical glaciers — such as those on the Tibetan Plateau — and climate processes elsewhere on the planet. “Because [the Tibetan Plateau] is the highest and largest of Earth’s elevated regions, it plays a significant role in the global climate system,” he said. The ice is currently being stored in a -22-degree (F) freezer at Ohio State’s Byrd Polar and Climate Research Center (BPCRC), said BPCRC post-doctoral research fellow Emilie Beaudon, adding that part of the core will be sent to the National Ice Core Laboratory in Denver for future investigations. Though the ice is the oldest discovered outside the polar regions, scientists are unearthing even older ice in places like Antarctica. In August, scientists determined that an Antarctic ice core contained 2.7-million-year-old ice — the oldest ever recorded. From the ice they were able to find that 2.7 million years ago, atmospheric carbon dioxide levels were less than 300 parts per million. Last year, atmospheric CO2 surpassed 400 ppm for the first time in 3.6 million years. Collaborators on this project include Ellen Mosley-Thompson, Distinguished University Professor of Geography at Ohio State and Director of BPCRC; Mary E. Davis, Stacy E. Porter, Emilie Beaudon, Ping-Nan Lin, M. Roxana Sierra-Hernández and Donald V. Kenny, all of Ohio State; Tandong Yao, Guangjian Wu and Baiqing Xu of the Institute of Tibetan Plateau Research; and Ninglian Wang of Northwest University and Keqin Duan of Shaanxi Normal University, both in Xian, China.